You hear the controller say “Cessna 4-3-0-2-Lima, Runway 27, cleared for take off.” You turn around to make sure your passengers are all belted in. “Ready to fly?” you ask. They nod eagerly. The next few seconds are a bit of a blur – the rapidly increasing sound of the engine, racing down the runway till suddenly all that seems to fade away as the aircraft gracefully leaves the ground beneath it. You look down at the little planes dotting Oakland airport as they get smaller, and then suddenly you hold your breath – just beyond the boundary of the airport, the magnificent structure of the Oakland Arena and Coliseum have come into view – your once-in-a-lifetime experience of a flying tour of San Francisco Bay has begun! You spend the next 45 minutes looking down on the traffic on the Nimitz Freeway, imagining what a traffic reporter's job would be like, admire the beautiful colors of the spinnakers on the sailboats in the bay, look down on Alcatraz island, as tourists disembark from the tour boat to begin their visit to the island prison, and finally, look down on the wonderful rust-red Golden Gate bridge in a way that few of your friends can. In my own case, there was never any doubt that I'd become a pilot. I grew up on Air Force bases in India, watching my pilot father fly fighter aircraft every day as part of his job as a test pilot in the Indian Air Force. But when I moved to the US I found that finally realizing that dream was, truly, a piece of cake. I enrolled in a flying school in Hayward, and within a few weeks, had soloed, and was well on my way to earning my Private Pilot's License. 5 months later, I passed a 'check-ride' with an FAA examiner, and was rewarded with a typewritten document that authorized me to rent planes and carry passengers. My wife was my first passenger, and our first flight was a lovely day trip around the San Francisco bay, over the Golden Gate bridge, and then to Half Moon Bay for a wholesome brunch at the '30 cafe' at the airport there, named after one of the runways, Runway 30. Over the years, we've taken trips as far South as San Diego, North to Oregon (Crater Lake, with another flying couple – we shared costs and flying responsibilities) and Eureka / Arcata, East to Yosemite, Lake Tahoe / Reno and a number of small places that we otherwise would never have visited. I've taken hundreds of friends on the 'Bay Tour' I described earlier. All of them return with a wow on their lips, plenty of unique photographs, and an overall feeling of awe. Many people ask me about flying and I then realize that there are many myths about earnings a pilots license that serve as a barrier to discovering this truly fascinating sport. I hope to dispel some of them here. The first and most oft-quoted barrier is the cost of flying. A flying license generally costs $5,000, give or take $1,000 – the actual costs depend on how long you take to earn your license, since students generally rent an aircraft and pay instructors by the hour (these represent the largest segment of costs of your training). Since most working folks can only fly weekends, this means it'll take you 5-6 months to complete the necessary hours, which means you'll end up spending $1,000 or so a month. On an ongoing basis, you pay for the time you rent an aircraft and for the fuel you use when you fly it. I fly every other weekend, so it costs me $150-200 a month to maintain my hobby. You'd agree that's a pretty reasonable price to pay for such a wonderful and unique activity. The economics are pretty good on a long trip too. For example, on the trip to San Diego, we flew for a total of 7.5 hours. So although we had the plane for the three days of the Labor Day weekend, I only paid for hours flown, and the trip therefore cost me around $600. Given that there were four of us, it works out to $150 a head, slightly under the $160 Southwest Airlines would've charged us to get there and back. The best part was, we were in San Diego by 9:30 AM, while on Southwest we would only have been there by 1:00 PM. The second question people ask me is whether it's safe. There's no denying that there is an element of risk involved in flying, like there is in any sport. However, the risks in flying are not significantly greater than lots of other activities that we indulge in on a regular basis, including driving. Risks are minimized by doing things sensibly – training well, staying current, making the right decisions, ensuring that your aircraft is well maintained, being careful about your preflight, and not putting yourself in situations that exceed your ability. Most accidents are caused by pilots who do dumb things – flying into weather that they're not qualified to handle or in situations that are beyond their capabilities. Flying makes you take responsibility for your actions in ways that nothing else does. When you're up there alone, there is nobody else to rely on, nobody to blame, and no Escape button to turn to. It teaches you things about yourself that you didn't know existed. A solo flight on a late evening when the setting sun paints the sky with a truly beautiful and sublime palette even gets you thinking about God. Of course, if I've convinced you that it's safe and the costs are reasonable, you may still ask me “Why Fly?” There are many reasons, and each pilot probably has his own; I'll give you some of mine. To start, I love the freedom that flying gives me – this might sound like cliché, but getting airborne is like being born again – the bonds fall away as you put more distance between your aircraft and the ground. Second, it gives me the opportunity to visit places that I would never have otherwise considered going to. The beautiful approach into Half Moon Bay airport, for example. 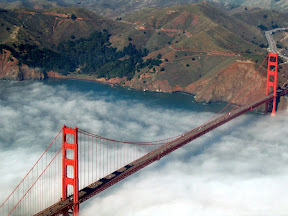 Or the view of the Golden Gate from the air. Or the little town of Columbia, in the foothills of the Sierra Nevada, where a short walk from the airport lies a quaint little mining town where you can rent pans and pan for gold, see people in period costumes and even see a horse drawn fire engine. Lastly, it is an activity that leaves little room for sloppiness – I take pride in staying proficient and current and in the pleasure that a smooth landing in a stiff crosswind gives me. As I mentioned, flying is an activity that demands you take ultimate responsibility for your actions – no excuses or complaints. d a flying school in the airport near you and set up an introductory flight with an instructor. Go up (the instructor will let you handle the controls once you are in the air) and see if you like it. If you think flying is for you, discuss a schedule with that instructor that you can financially support, and get started. There are some great resources on the web for beginner pilots — www.beapilot.com or www.projectpilot.org, for example. All the best and happy landings!! This entry was posted in Features on April 12, 2007 by vpdot.